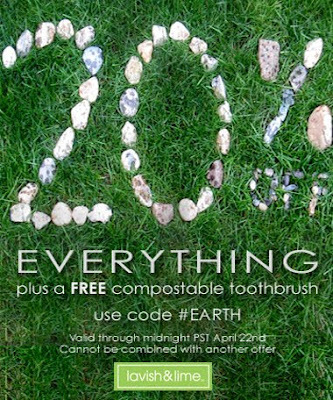 Earth Day has come early at Lavish & Lime and we’re celebrating all weekend long with a special Earth Day Deal! Take 20% OFF sitewide on everything – all our eco-friendly and non-toxic alternatives from waste-free lunch gear to natural cosmetics – plus receive a FREE compostable toothbrush with code #EARTH through April 22nd. The toothbrush becomes organic soil in 180 days. We think that’s a pretty cool gift for you, and for the earth. Happy Earth Day weekend to you all!